Comet 1P/Halley can be observed from Earth once every 75-76 years and is probably the most well known comet under the “household name” of Halley’s Comet. The comet has earned this celebrity status by taking regular visits to the inner solar system and being the only short period comet that is so clearly visible to the naked eye on each passage. The image above taken by NASA was from Halley’s last visit in 1986. It was during this passage that the giant ball of ice was the first to be observed by a spacecraft which provided vital data on the structure and behavior of a comet nucleus, coma and tail. There are records of Halley’s Comet dating back as far as 240BC. There are historic records from the ancient Chinese, Babylonion and medieval Europeans alike of the comet which can be accurately matched to Halley’s back-dated orbits. When was Halley’s Comet last seen? The last pass of Halley’s Comet was the closest approach of 1986. It was the first time that spacecraft were sent up close to a comet to observe a comet’s nucleus in detail. 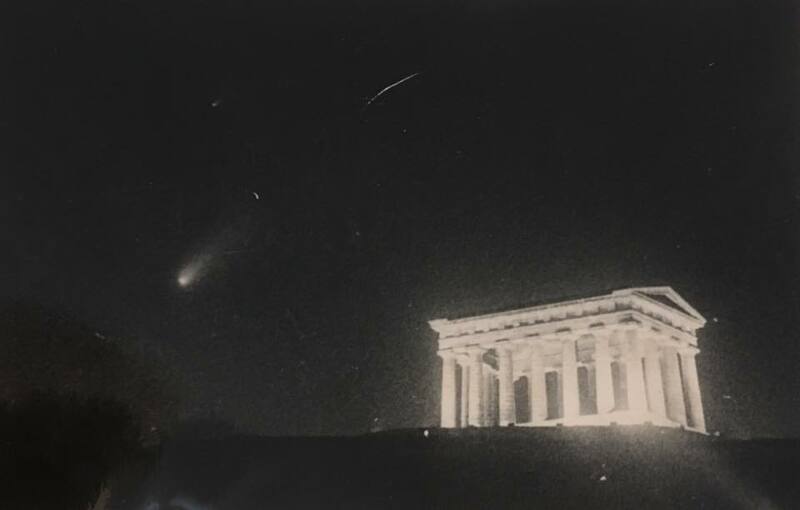 However, for observers on the ground, the 1986 apparition was one of the worst viewing circumstances for viewing Halley’s comet. This was due to the comet’s position relative to Earth (at opposite sides of the Sun). The point at which the comet reached its brightest was when the famous object was closest to the Sun as viewed in the sky. Many observers in urban areas did not get a decent view of the comet as light pollution washed out the tail. Some observers in more rural areas got a good view with binoculars and telescopes over the nights when it was a little further from the Sun. Despite the unfortunate position of the Comet, photographers were also able to get some nice shots like the image above taken over Penshaw monument, Sunderland by Gordon Percival (a founder and long serving member of South Shields Astronomical Society). The comet’s orbital period was first discovered by an English astronomer by the name of Edmund Halley in 1705 which is why now the comet is crowned the famous name. He examined reports of a comet approaching Earth in 1531, 1607 and 1682. He concluded that these three comets were actually the same object returning to the solar system in an orbit, and predicted that the comet would come again in 1758 and of course, when the time came his theory was vindicated despite him not living to see the event for himself. The comet was then rightfully named after him. Just like Edmund Halley’s clockwork predictions, Comet Halley will return again in the year 2061 with perihelion occurring on 28th July that year. It will be better placed for observation compared to that of the 1986 appearance as the comet will be the same side of the Sun as the Earth during perihelion. Halley’s Comet is expected to reach visual magnitude -0.3 in the 2061 pass. Comet Halley’s orbit comes close to Earth’s in two places. For this reason, Halley is the parent body of two meteor showers as viewed from Earth: the Eta Aquariids in early May, and the Orionids in late October. 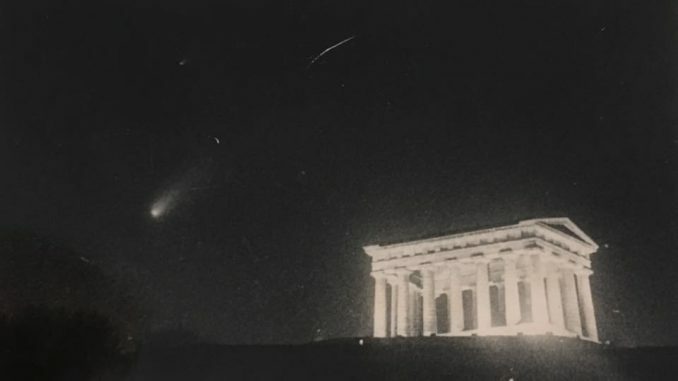 Observations conducted around the time of Halley’s appearance in 1986, however, suggest that the Eta Aquarid meteor shower might not originate from Halley’s Comet but may well be perturbed by it. My father saw it at his first visit of the 20th century and was hoping to see it again. But when it passed again in 1986 my father had been dead for 10 years.I had been an astronomy fan and took basic astronomy classes and even bought a $300.00 Edmond Scientics telescope( that is the money I could afford then. I had been wondering from were I got this passion for astronomy and I had just now realized that it was because all the things my father talk about this comet. It could be seen much better when my father saw it because there was no so much light contamination produced know by the streets electric lights. Small coincidence. I’m reading Arthur C.Clarke’s The Hammer of God. The mention of Halley prompted my need to know. Most facinating book. I missed the last pass, and I’ll be gone well before 2061…too bad. In 1986 we woke up to view the comet and we were so amazed….we opened our front door and there it was, a massive bright beauty, it was stunning. My daughter was 9 and was enthralled, it will be something she will always remember. We won’t be around when it passes again but that beautiful sight will stay with us. Truly a jaw-dropping experience when we opened our door and it was ‘just there’ in front of us. Hi, I have a question if it’s not too much trouble. Do you know if the comet was visible, even if it took a telescope, in the states of Michigan, Indiana or Illinois? I mean maybe it was visible all around the world but I was born 3 years later and can’t find that data. In which month did you see it? I apologize for disturbing you. Thank you and sorry. I can confirm that Halley’s Comet would have been easily visible from the states of Michigan, Indiana and Illinois from late 1985 in to 1986 in the evening sky after Sunset during November-December 1985 and visible before Sunrise in 1986. Hi, thank you so much. Small question tho, in 1986 was visible during march or february in Michigan, Indiana and Illinois? Because I read in a website it was visible on april 1986 (in south america)too but maybe it changes from country to country. Thank you for your time.